The late Robert Todd exposed a long standing hoax when he published this exposé of the Shulgen Letter in 1997. While few, if any, UFOologists today give any credence to the hoaxed version, it is quoted in many UFO/Roswell books that were published prior to 1997, and we still see it referenced on some websites . For that reason, Bob's work is still vitally important in the study of UFOs. A transcription of the REAL Schulgen Memo can be found here. Through the efforts of the Fund for UFO Research (FUFOR), three documents have been made available to the general public for almost ten years. These documents consist of a 30 October 1947 cover letter from Air Force Brig. Gen. George F. Schulgen, then Chief, Air Intelligence Requirements Division, Office of the Assistant Chief of Staff, A-2 (Intelligence), and the two documents the cover letter forwarded to "CSGID," apparently the Intelligence Division of the Army General Staff. The two enclosures consisted of a document identified as "Intelligence Requirements," and another document identified as a "Draft of Collection Memorandum." All three documents appeared in a FUFOR publication entitled Documents and Supporting Information Related to Crashed Flying Saucers and Operation Majestic Twelve, dated June 22, 1987, compiled by Dr. Bruce Maccabee, then-Chairman of FUFOR. Dr. Maccabee's narrative claimed the documents "were released by the National Archives in 1985" and the declassification authority shown on Schulgen's cover letter indicates the documents were copied for somebody on January 29, 1985. 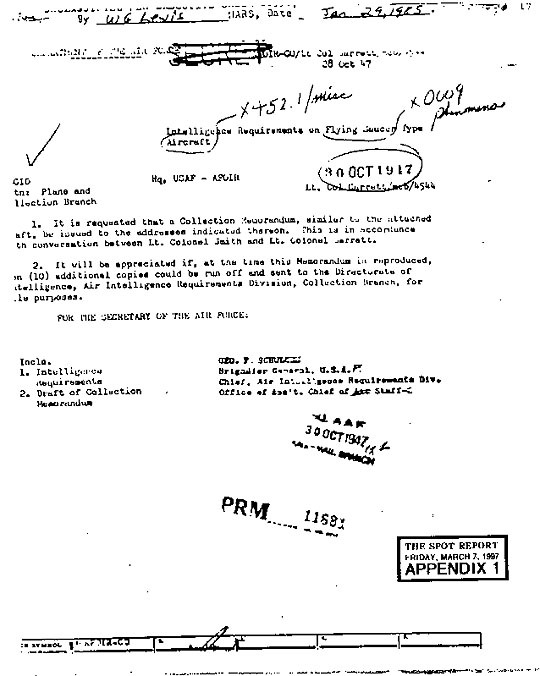 All three documents also found their way into another report prepared by FUFOR, entitled The Roswell Events, a supposed "Congressional briefing" revised and updated in December of 1993, and which FUFOR furnished to a number of senators and congresspersons in an attempt to enlist their support for an official inquiry (hearings) into the Roswell incident. Not surprisingly, at least one copy of the "briefing" also found its way into the files of the Office of Science and Technology Policy (OSTP), headed by Dr. John Gibbons, President Clinton's science advisor. In addition to figuring in the wildly speculative theories contained in the narrative portion of Dr. Maccabee's compilation, the three documents in question have been lauded in two books by Timothy Good, Above Top Secret and Beyond Top Secret. In both books, Good, a British "researcher," characterized the documents as "strong evidence" that General Schulgen knew about the alien craft recovered during the Roswell incident. American "researchers," Stan Friedman and Don Berliner, co-authors of perhaps the most fantastically absurd book ever published on the Roswell non-event, Crash at Corona, also pointed to these documents to support the idea that the government lied about Roswell, and that an alien spaceship and its alien crew actually were recovered, by the Air Force, which has hidden the "truth" from the public ever since. This would be all well and good, if not for one simple, indisputable fact: All three documents are fakes! Peter Gersten, legal counsel for Citizens Against UFO Secrecy (CAUS), first brought these documents to my attention in August of 1987, when he furnished me with copies. Gersten suspected the documents were fakes and asked for my opinion. I compared the fake draft to Intelligence Collection Memorandum No. 7, "Unconventional Aircraft," dated 21 January 1948 (which was the final, published version of the draft memo), and although the classification markings on the draft seemed unusual for the time period, and numerous other differences between the draft and final versions were noted, nothing stood out as conclusive evidence that the documents were anything but authentic -- irrespective of the reference to "interplanetary craft," which I merely attributed to differing opinions that allegedly existed among military personnel who had official involvement with the subject at the time. I informed Peter Gersten that I had no good reason to believe the documents were not authentic. Nevertheless, the unusual classification markings nagged at me for almost ten years. During the intervening years, I received only two requests for copies of the three documents as they appeared in the FUFOR publication, with one of those requests coming late last year. Because the classification markings continued to haunt me, in each instance when I furnished copies, I had to inform the recipient that, while I saw nothing that stood out as proof the documents were fake, since I had not obtained the documents myself, I could not vouch for their authenticity. After the second request for copies, I decided to lay my suspicions to rest by obtaining copies of the originals from the National Archives. Archives personnel furnished those copies in late January. 1. The classification markings on the fake cover letter are different from those on the genuine letter, and are unusual for the time period. Without the genuine document for comparison, the classification markings, in and of themselves, are not sufficient to justify calling the fake letter a fake. 2. The genuine and fake cover letters both display handwritten notations, "X452.1/misc" and "X0009 phenomena," that are cross references to other decimal file numbers and titles. The hand writing on the genuine and fake versions is different. 3. Although the text of the fake and genuine cover letters is the same as the text of the genuine letter, it's clear that the fake was retyped using a different typewriter. In particular, note the differences in the typewritten numbers at the top of the page near the "SECRET" stamp, and below the date, "30 OCT 1947," rubber stamped on both documents. 4. On Appendix 1 (the fake cover letter), the stamped date, "30 OCT 1947," clearly is a composite made by at least 2 different rubber stamps. The letters in the "OCT" portion are noticeably larger than the number portions, "30" and "1947." In addition, the year portions of rubber stamp daters are formed as one piece, with the numbers spaced closely together. On Appendix 1, however, the numbers are spread out more than would be expected it the year had been applied with a real date stamper. The numbers "47" in "1947" also appear to be slightly raised, suggesting that each individual digit moved freely. Thus, it appears that the "30" and "1947" portions were applied using a numbering rubber stamp to achieve the day-month-year military style date stamp. Also, it is highly unlikely that, in 1985 or 1986, the forger had access to a date stamp that had the preformed year "1947" on it. The letter "T" in the "OCT" portion of the date stamp on Appendix 1 appears to be slightly raised, which suggests that the "OCT" portion of the date on the fake cover letter was formed using a do-it-yourself rubber stamp kit known to be available to Bill Moore of Roswell fame. 5. At the bottom of the genuine cover letter (Appendix 2) there appears a blocked area that was printed directly on the sheets used for carbon copies using a printing press. These blocks were used to record the initials of agency officials in the various offices involved in the coordination. In the case of the cover letter, two offices coordinated on it: AFOIR CO (the Col lection Branch of the Air Intelligence Requirements Division), and AFBIR, which was Gen. Schulgen's office. Appendix 2 shows that Lt. Col. George Garrett initialed the coordination block for AFOIR-CO, and Gen. Schulgen initialed for his office. A portion of the coordination block also appears at the bottom of the fake cover letter (Appendix 1), and, oddly enough, the typed office symbols, "AFOIR-CO" and "AFBIR," appear in exactly the same positions on both copies. In addition, a small portion of Gen. Schulgen's initials also appears on the fake, and, like the typed office symbols, that portion of Schulgen's initials appearing on the fake version appears in exactly the same position as on the genuine version. Since the fake and genuine cover letters were typed on two different typewriters at different times, the only reasonable explanation is that the coordination block was cut off a copy of the genuine document and pasted on the bottom of the fake for added authenticity. 6. It also appears that the stamps, "PRM 11681" and "HQ AAF" with "30 OCT 1947" and "AAG - MAIL BRANCH," were cut from a copy of the genuine letter and pasted on the take. Overall it is clear the forger went to a lot of trouble to make the fake cover letter look like the genuine cover letter. At first glance, one could be mistaken for the other, and without the genuine document to compare the two, there would be no good reason to suspect forgery. 7. The declassification notice at the top of the fake cover letter does not appear on the genuine cover letter, for good reason. The declassification notice on the genuine cover letter was rubber stamped on the document when it was copied for me. More important, however, is the fact that the declassification notice on the fake cover letter also was cut from another document and pasted onto the fake to add authenticity, and to "validate" the document as one "released" by the National Archives. In fact, the declassification notice on the take cover letter was taken from one of the documents furnished to me by the National Archives in 1985. In 1984, I submitted a request to the Archives for the decimal 000.9, "Flying Discs" records among the decimal correspondence files of the Air Force Director of Intelligence that were located at the National Archives facility in Suitland, Maryland at the time, as part of Record Group 341. Mr. William G. Lewis was the archivist at the Suitland facility who handled the request for me. Because approximately 2,000 pages of records were involved, copies of the records had to be shipped to me in batches. As each batch was copied, a declassification "slug" was prepared, consisting of a slip of paper with the declassification authority typed on it. Also contained on the slug was the number assigned to the de classification action for the records in question, as well as the name of the archivist who handled the request for copies, and the date the copies were made, which, in the case of the take cover letter was January 29, 1985. The declassification slug then would be taped face down on the copy machine, so that the declassification authority would appear on each copy automatically, saving Archives personnel from the laborious task of stamping each document individually. Once the copying was completed, the declassification slug would be discarded, since it pertained to a specific batch of records that had been copied on a specific date. Sometimes the archivist's name or initials will be typed on the slug, along with the date of copying, but sometimes this information will be hand printed on the slug, as in the case of the fake cover letter. As it turns out, the hand printed "W G Lewis" and "Jan 29, 1985" on the fake cover letter are identical -- not just similar, but identical -- to the same information hand printed on a declassification slug used on one of the batches of records furnished to me in 1985 by Mr. Lewis from the decimal 000.9 files located at the Suitland facility. 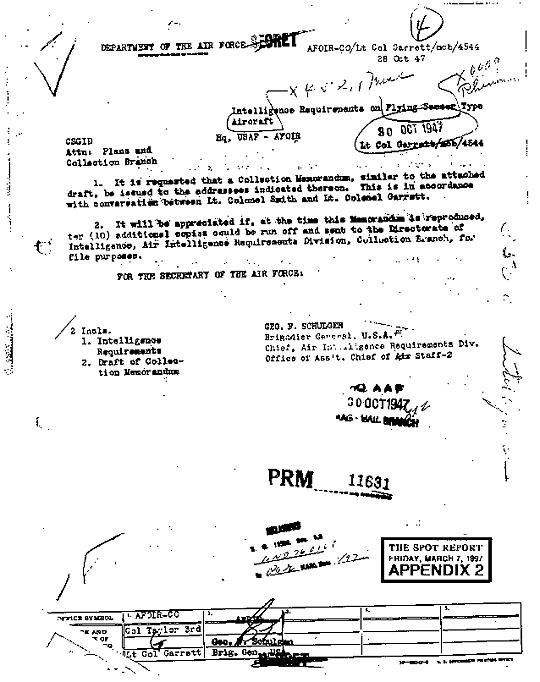 Reproduced below as Exhibit 1 is a copy of the declassification slug from the fake Schulgen cover letter. Exhibit 2 is a copy of the declassification slug from the batch of 000.9 files copied for me on January 29, 1985, and Exhibit 3 is a copy of the declassification slug from the batch of 000.9 files copied for me on January 24, 1985. An examination of Exhibits 1 and 2 will show that the hand printed information is identical in both exhibits, although the printed information on Exhibit 2 appears darker due to copying variations. The hand printed information in Exhibit 3 appears similar to the others, but not identical. Also noteworthy is the fact that, although the top of the fake cover letter shows a declassification slug for use on a copy machine, not one of the pages of the supposed enclosures bears the declassification notice, as if the notice on the cover letter was placed there only to "validate" the document as having come from the National Archives. A careful examination of the genuine cover letter shows that it was prepared on the government size paper in use in 1947. Government size paper was slightly smaller than the typical 8 1/2" x 11" paper used in the civilian world. (In recent years, Congress changed the law so that standard 8 1/2" x 11" paper would be used by all government agencies.) As a result, the borders of the genuine cover letter appear on the copy of the letter furnished to me by the Archives. When the genuine cover letter is held up in front of the fake cover letter so that the right-hand edge of the genuine letter is positioned at the right-hand edge of the hand printed cross reference, "X 0009 Phenomena," on the fake letter, it becomes apparent that the fake letter couldn't have been prepared on government size paper, even though it was typed on a different typewriter, and even though it displays the printed coordination blocks at the bottom, which were applied to genuine government paper using a printing press. Had it been prepared on government size paper, the left-hand margin would have been far too narrow, and certainly would not have been considered acceptable. Likewise, all pages of the two genuine enclosures to the genuine cover letter also were typed on government-size paper then in use. In addition, if the right-hand edge of the coordination blocks on the fake and genuine cover letters are lined up, the handwritten word, "Phenomena," would run off the page. The fake cover letter is, therefore, a retyped cut-and-paste fake. There is NO doubt about it. Because the fake cover letter could not have been prepared on government-size paper, if the person who claims to have "found" the fake documents in the Archives -- which almost certainly is the same person who forged the documents -- comes forward and produces copies of the documents from among genuine records at the Archives, it is safe to predict that the documents this "person" will produce will have to be on 8 1/2" x 11" paper. In addition, the cover letter will not be on onionskin-type paper used for carbon copies, will not have the coordination blocks at the bottom printed on it in ink from a printing press, will not have the rubber stamp markings applied directly to the paper, and will not have the coordinating officials' initials signed in the coordination blocks in ink, and none of the documents will be on government-size paper. In fact, the cover letter will have to be a modern day photocopy on modern-day 8 1/2" x 11" paper. All of the fake documents will have to be on 8 1/2" x 11" paper. There is a possibility that the retyped originals of the fake enclosures to the cover letter were inserted into one of the files at the Archives by the forger -- but they won't be on government-size paper. In addition, the "SECRET" stamp at the top of the cover letter clearly was applied over the retyped information, "AFOIR-CO/Lt. Col. Garrett," which means it had to be applied using a rubber stamp when the document was forged circa 1985-86. Furthermore, the "SECRET" marking at the top of the cover letter matches the "SECRET" markings on the fake enclosures, which further verifies that the enclosures are indeed fakes. Since it is unlikely the forger sat in an Archives reading room and applied the fake "SECRET" stamps to fake documents, it is possible the forger typed up the fake enclosures to the cover letter, applied the fake "SECRET" stamps and then went to the Archives and inserted the fakes into a file, in which case they may not be photocopies. but they certainly will be on 8 1/2" x 11" paper and not on government-size paper. If the fake cover letter also was inserted into a file at the Archives, it will have to be a photocopy on modern-day, 8 1/2" x 11" photocopy paper. 8. Handwritten along the right-hand edge of the genuine cover letter is the notation, "350.09 Intelligence," which is the decimal number and title of the file in which the genuine document is located. The fake cover letter bears no such notation, perhaps to thwart attempts to find the genuine documents. According to the Archives, copies of the genuine documents are not filed in "452.1 Misc." or in "000.9 Phenomena," files that are cross-referenced on both the fake and genuine cover letters. By leaving out the reference to "350.09 Intelligence," perhaps the forger thought his forgery would never be uncovered. Without the genuine documents, it's very difficult (if not impossible) to prove forgery.